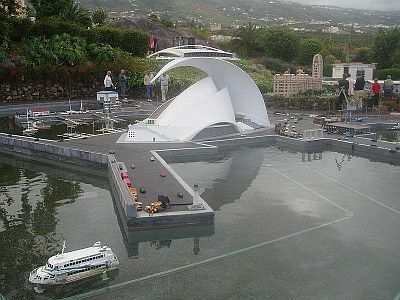 Pueblochico - a unique attraction consisting of Tenerife-in-miniature! 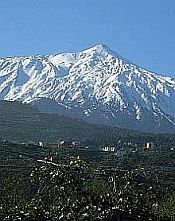 Up near the town of La Orotava, you'll find Pueblochico, a delightful representation of Tenerife in miniature. The park covers 20,000 square metres and features all the major landmarks of the island. It's a working model, too! All the cars in the picture above will be moving. This is a life-sized depiction of the famous barren landscape found near the village of Vilaflor. Visitors can freely wander about this area, exploring the authentic caves. Here you'll find depictions of the life of Tenerife's original inhabitants, the Guanches. See their primitive society and how they lived together in their villages. A section displaying all the endemic flora of the island, with the famous Dragon Tree as its centrepiece. This area depicts typically rural life in Tenerife, with village buildings and tilled land. One of the most impressive areas, this represents parts of Santa Cruz, featuring, amongst other things, the unique Auditorio building. 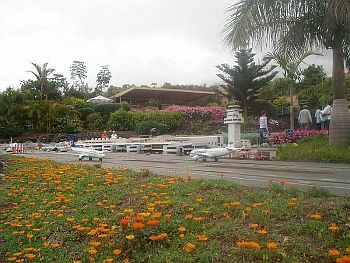 As the title says, this part of the attraction is a garden area containing all manner of rare, exotic plants. Full of miniature representations of many of the famous historical buildings on the island. 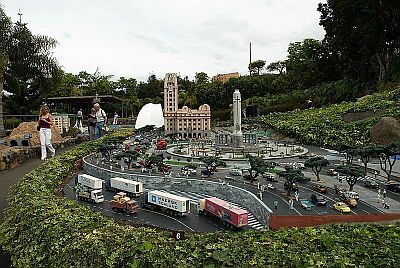 This is a faithful reproduction of many landmarks of La Laguna. To find this attraction, you need to be travelling along the TF-5 north motorway, exiting at junction 35. Follow initially the signs for La Orotava, then the ones for the miniature village.